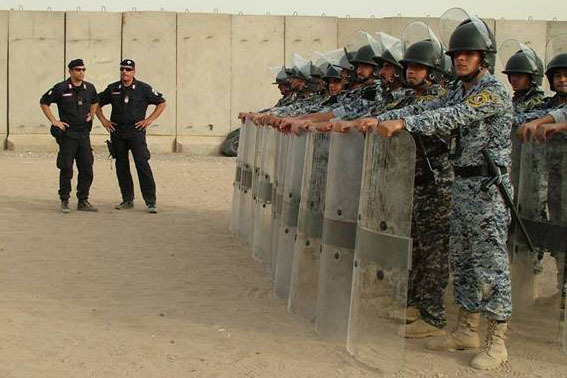 Bagh­dad– Since their mis­sion began in 2007, the Ital­ian Cara­binieri have trained 8,296 Iraqi Fed­er­al Police, plus anoth­er 530 Iraqi police­men who are cur­rent­ly tak­ing part in the 14th Lead­er­ship Train­ing Course in Bagh­dad. FOB Camp Dublin. Train­ing course for Iraqi Fegeral Polic­men – 1st phase of the course. Major Gen­er­al Clau­dio Angelel­li, Deputy Com­man­der of NATO Train­ing Mis­sion in Iraq, stressed that these sig­nif­i­cant results add to the achieve­ment of the 133 instruc­tors trained by the Cara­binieri. This achieve­ment seems numer­i­cal­ly less impor­tant but proves the impor­tant pur­pose of the self sus­tain­abil­i­ty planned for the end of 2011. These train­ers, clas­si­fied in T3 (Train the Train­ers “Basic instruc­tors”) and T5 (Train the Train­ers, Trained by the Iraqi “the best of the T3 instruc­tors) rep­re­sent the mul­ti­pli­er effect of the train­ing activ­i­ty. All these train­ing ini­tia­tives were cre­at­ed in a frame­work of flex­i­bil­i­ty and adher­ence, at the request of the Iraqi Fed­er­al Police, as stressed by Gen­darmerie Divi­sion Head of NTM-I, Colonel of the Cara­binieri Mau­ro Isidori, and Chief Gen­darmerie Train­ing Unit, Lieu­tenant Colonel Robert Jer­voli­no. This impor­tant con­tri­bu­tion of train­ing offered by the NTM-I is only a part of the wider NATO train­ing pro­gram for the Iraqi Secu­ri­ty Forces. ^^^^^^^^^^^^^^^^^^^^^^^^^ * T3: “Train the Train­ers”, basic instruc­tors ** T5: “Train the Train­ers, Trained by the Iraqi “the best of instruc­tors” which through fur­ther selec­tion process­es and train­ing is rec­og­nized abil­i­ty to train basic instruc­tors, the “T3”.